As of this writing, I just finished Luke Cage season 2. Obviously, by the time you read this, that will have come out months ago, but I write these well in advance in case anything comes up where I can’t (for reference’s sake, volume 19, The Long Halloween, was just published yesterday). Sometimes it really matters, too, because I just went through through a stretch of two+ weeks where I couldn’t write anything because I was on vacation and then getting my MacBook fixed. Anyway, let’s talk about Luke Cage now that it’s super old for you! I ended up enjoying it, and that surprised me because the first four-to-five episodes were awful. It’s weird if you look at the Luke Cage series as a whole… there was a strong first half of season one and a quality back-end of season two. Everything in-between was awful. But at least they picked back up. The ending was intriguing… it feels like a take-off of Bendis’ Daredevil when DD declared himself the new Kingpin of Crime, thinking he could do better and keep everyone safer if he was in control. Funny enough that we won’t get to see where that goes since Netflix is purging all their Marvel properties. Thanks for the cliffhanger, Netflix! Protagonists: See also: The title. Antagonists: Jennie, Tombstone, Black Mariah, Manslaughter Marsdale. Luke Cage and Danny Rand. There simply is no friendship or partnership in comics that equals that pairing. Booster Gold and Blue Beetle probably comes the closest, but ultimately, Cage and Iron Fist just belong together. Luke and Danny reunite for this series to bring their former assistant home after she is released from jail. She had been possessed and forced to kill her ex-boyfriend, and having finally been exonerated, the boys are there for her. While they are with her, she asks that they rescue a necklace that had belonged to her grandmother and has since fallen into Tombstone’s hands. Rand and Cage, wracked with guilt over what happened to Jennie, of course agree, and that sets the story in motion. The necklace is, obviously, more than a familial charm; it is the Supersoul Stone, and Jennie figured out how to unlock its power while she was incarcerated. Seems she isn’t too keen on her partners allowing her to be locked up for so long (or at all, really). Jennie has hooked up with Mariah Dillard—Black Mariah—and uses the Supersoul Stone to become some kind of demon monster to help her new ally rise to power. This turns Danny and Luke’s “one-time only, we are NOT getting back together” day trip into a longer reunion to rescue Jennie from the influence of the necklace. The power of friendship wins the day, and with it all behind them, Cage agrees that he and Rand are, in fact, “back together”. There is a fifth issue, a stand-alone I included for review, too, where Cage and Danny run into G-lister Manslaughter Marsdale at a hot dog stand that plays out as one of those “he said/she said” tales where all the witnesses to the event have a different take on how it actually played out, with all the zany storytelling that promises. 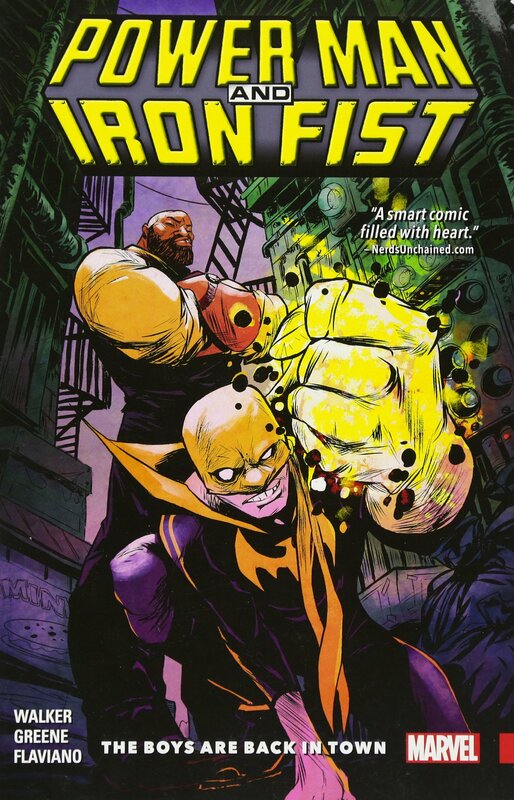 The series is really more about the partnership between Iron Fist and Power Man than it is the stories it is telling. Tombstone and ancient necklaces and the like aren’t grand comics writin’, but you’re coming for the duo playing off of each other, and that’s what you get. The book is simply fun. 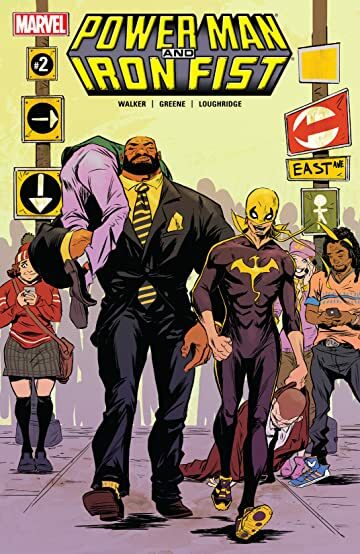 It very much strives to be in the same vein as Matt Fraction’s Hawkeye or Nick Spencer’s Superior Foes of Spider-Man by messing with tropes and expectations while putting personal spins on the characters. I will say that while all three of those titles had a stylized sort of art, Power Man & Iron Fist’s art was the least of them. Sanford Greene’s work is not necessarily bad, and it does fit the title, but it’s a bit too awkward and silly in parts. Tombstone, in particular, constantly looks like a large fish for some reason. Everything else has this… griminess to it? Not sure how to describe it. Maybe that’s from the inks, but there are a lot of thick black shadows and excessive lifework that makes everything look gritty or dirty. There are some fun running gags throughout, mostly playing Iron Fist’s optimism and positivity against Luke’s more grounded and world-weary attitude. From the beginning, Danny is excited for the possibility of a Heroes For Hire reunion, but Cage has Jessica Jones and a baby at home, and he doesn’t have the time or energy to devote to a partnership again. Speaking of Luke’s family, there is Danny’s perpetual insistence that Luke say “hi” to Jess for him and Cage’s refusal to do so (leading to Danny’s lamenting that it is why Jessica doesn’t like him), as well as Luke’s new replacement words for vulgarity at Jess’ demand when baby Danielle started repeating some of Luke’s curses. So we are treated to a Cage who runs around exclaiming “fiddle faddle” and “knick-knack paddywhack”. There’s a lot of fun at Tombstone’s expense with characters remarking on his weird fascination with whispering, too. The pair sells the book. They are a great duo who should almost always be sold as a package, and getting them back together here was a blast. Talking Point: So I name checked Luke and Danny and Booster and Blue Beetle. And on my podcast, we did a list once (several months ago, when our microphone quality was not as good as today) on this topic, but I ask you: What are some of your favorite BFF’s in comics history? It’s definitely a good book, but the art isn’t my flavor, and some of the gags feel a little thin after a while. If you are comparing it directly to Hawkeye or Superior Foes of Spider-Man, it’s not as good as either of those. But it’s enjoyable and has a lot of heart. And Danny and Luke are always great together.